This colorful hand made equipale sofa and two chair set is crafted from tanned pigskin and Mexican cedar strips. 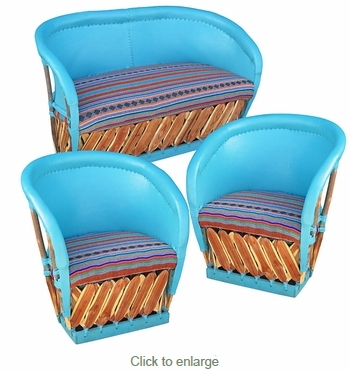 This durable and comfortable Mexican furniture set is painted in a choice of 4 colors and finished with matching fabric upholstered seats. Our painted equipale furniture will create a bright and inviting southwest atmosphere on you rpatio or in any room of your home.